18 holes, par 69, 6294 yards. Parkland. 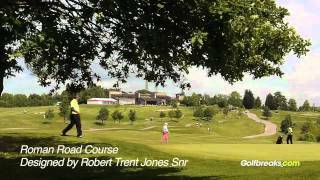 Opened for play in 2007 and designed by Ryder Cup Legend Colin Montgomerie, this terrific parkland course is a must play for any travelling golfers, especially if you are already staying at Celtic Manor. Similarly to the Twenty Ten course, The Montgomerie is strewn by copious pot bunkers, tricky greenside swales, and plenty of other natural hazards. Despite its parkland routes, the course itself actually has a very inland links feel about it – particularly when the wind is up. If this wasn’t enough, the course also provides fantastic views throughout, with some rather exciting tee shots over the valley to match. Just like everything else at Celtic Manor, The Montgomerie will do nothing apart from exceed your expectation and more – a truly fantastic golf resort. Golf carts are available from the golf shop for £30 per buggy – we would recommend booking these early in advance due to availability. Electric trolleys and pull trolleys are also available.